The Chirps Theme is a blog | magazine theme ready for nowadays trends, ready to help you stand out from the crowd. We want to introduce you a tool that lets you customize almost every page element and build remarkable sites. You’re ready to use modern, unique elements and make your content impossible to ignore. Your visitors deserve it! Land – a premium WordPress theme developed specifically for personal, streamlined blog websites. Theme is classic-like, modern yet elegant, easy-to-use and with fully responsive layout. You will receive a detailed documentation along with additional features like Layout Creator, mosaic, slider and carousel features, unlimited color schemes, countless Google webfonts, custom widgets etc. 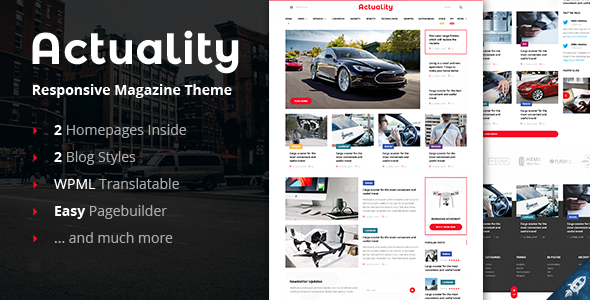 Actuality Blog & Magazine WordPress Theme, it’s a perfect premium WordPress Theme for newspaper, blog and magazine website. with a modern design, responsive and compatible with the main browsers, it looks good in desktop and mobile. Clean typography, SEO friendly, this theme also has perfect placements for Advertisements. With a useful Theme-Option panel, you can customize your website and build your layout in very easy way. 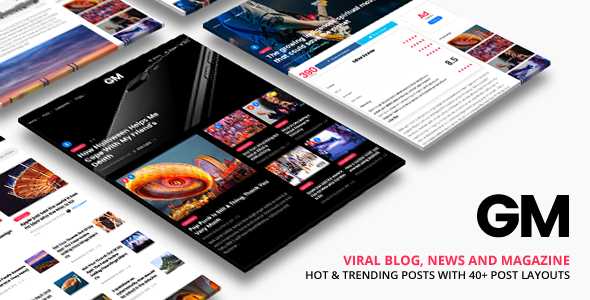 WP Portal – a premium WordPress theme developed specifically for magazine, news, editorial and blog websites they cover entertainment, reviews, gaming, technology, viral and gadget topics. Theme is bold, modern yet elegant, easy-to-use and with fully responsive layout. 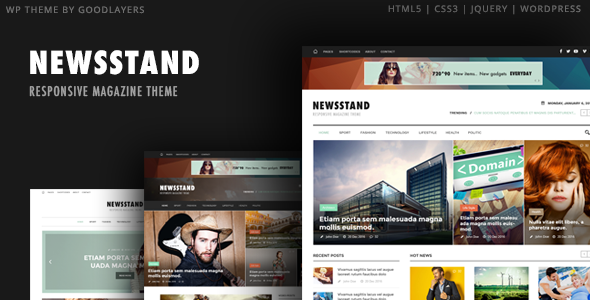 Newsstand is a responsive Magazine WordPress theme. This is the best magazine theme we?ve ever created. 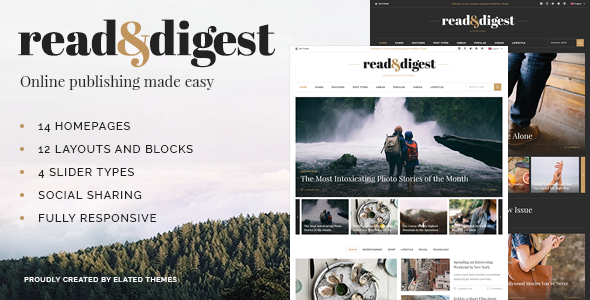 It comes with great features for magazine, news, editorial, blog, blogging, author, journal, newspaper, fashion magazine, sport news, business news, technology news website. You can set up blog page by using traditional category archive from main navigation, with this, you can set up top section with our great designed post board and bottom section with medium size thumbnail, full size thumbnail or column thumbnail post list style. Do you like these functionalities: Easy-to-Use Powerful Admin Interface, Loads of home and inner pages, Multiple Header Behaviors, Two headers (Sticky and Fixed header), Sticky on scroll up header, Styling options for elements, Fully responsive, Powerful post layout options, Unlimited layout combinations? 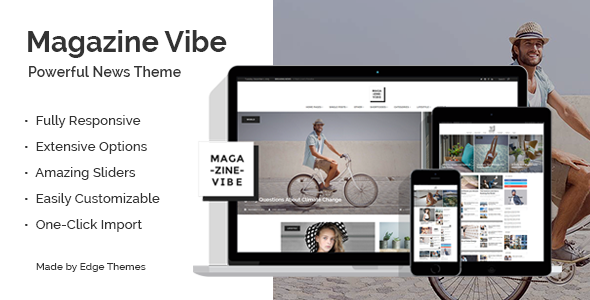 If yes, the Magazine Vibe is the right theme for your blog. Very stylish WordPress theme ofr every blogger. Theme offers tons of blog related functions like: Easy to use – no coding knowledge required, Powerful Admin Panel, Import demo site with One-Click, Responsive and Retina Ready, Extensive typography options, Instagram Feed Widget, Twitter Feed Widget, Breaking News widget, Date Widget, Social Icons widget. 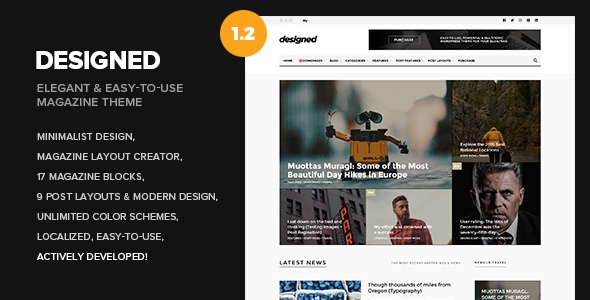 Designed – a premium money-making WordPress theme developed specifically for magazine, news, editorial and blog websites they cover topics like: entertainment, reviews, technology and product promotion / affiliate. You can earn money via multiple, dynamic ad sections or you can create/write product advertising posts (with affiliate links). Grand Magazine is a clean and minimal WordPress theme for Blog and Magazine web site. Built with the latest WordPress technology. Grand Magazine support responsive layout so it looks great on all devices. It has predefined styling for blog posts which can be imported with one click. 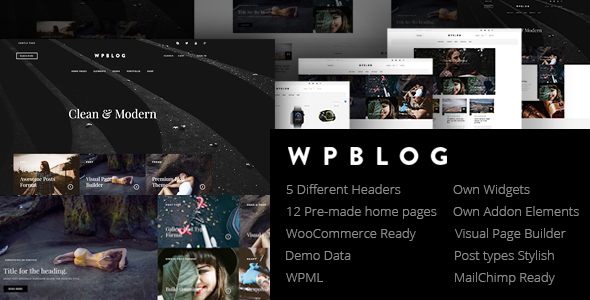 WP Blog – Premium WordPress Theme is Perfect for any Blog or Magazine. Create any page using the Visual Page Builder and Awesome Addon. Use more than 5 headers layout. And a lot of interesting things. Now you can easily collect a simple and reliable website in minutes with ready demo data.